Authors organize their writing based on the purpose of their text. Five of the main methods that authors use to structure their text are cause and effect, compare and contrast, chronological order, inductive presentation of ideas, and deductive presentation of ideas. Cause and effect present the reasons something happened. For instance, if I said, “If you go to bed late, you will be tired,” the cause is going to bed late and the effect is being tired. A cause and effect piece of writing is going to keep giving you reasons something happened and the effect of that particular reason. Compare and contrast writing discusses similarities and differences. It’s going to say how two things are alike and how they are different. These may also come across as pro and con pieces, where it gives you the pros of two things and the cons of two things. An example would be if I said as a thesis statement, “Those who are up to date on technology are still debating over whether DVDs or Blu-ray discs are better,” the author could go through and describe all the similarities between DVDs and Blu-ray discs and all the differences between DVDs and Blu-ray discs. In the end, you could make up your mind which one is better, because they are simply comparing and contrasting the two. Chronological order presents information in the order that it happened. It starts at the beginning and works its way to the end. A good example of chronological order pieces is biographies. You start whenever someone was born, you go through their childhood, adulthood, and events leading up to their death. The book is laid out to describe events exactly in the order that they happened chronologically in time. Inductive presentation of ideas starts with specific examples and moves to a general conclusion. If I were to want to convince you that it was good to donate blood, I would start off with lots of specific examples or reasons why it was good to donate blood, and then give you the general conclusion: You should always donate blood. Deductive presentation of ideas is going to be the opposite of that. It starts with that conclusion (You should always donate blood) and then it explains supporting examples. I would give you examples or reasons that list out the benefits of donating blood. You can see these are opposite. It’s important to remember the difference: Inductive is going to list all of them and take them into a general conclusion at the end. Deductive is kind of like division. You start with one big conclusion and divide it down into lots of supporting details or examples. 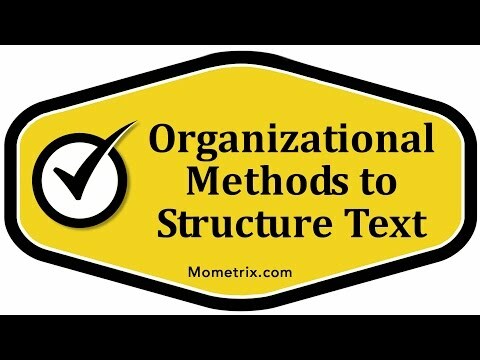 Whenever you are trying to organize your own writing, or trying to figure out the purpose of an author’s writing, try to figure out what the organizational method was and it might help you figure out the overall purpose of the text.